Interac mobile payment options for today’s digital world. For Canadians, Interac has quickly become the most trusted way to make purchases; not just in the online space, but in the digital realm of retail business. Interac provides a wholly secure link between consumers and their finances, delivering a fast, free and safe payment solution. The Interac name has become synonymous with unquestionably safe and secure online casino deposits for Canadian players. Only a handful of iGaming operators accept this payment method. And Interac only does business with the most reputable operators. The same goes for their land-based retail partners, providing yet another source of stress-free commerce throughout Canada. Today, we’re going to look specifically at Interac’s smartphone purchasing options. They include mobile wallet banking via Interac Flash and Interac Mobile Pay. Interac Flash is a service of RBC and Scotiabank, via each of their proprietary mobile wallets. Anyone who conducts their baking through a branch of the Royal Bank of Canada has access to the RBC mobile wallet; in turn giving them access to Interac Flash payments. The same goes for Scotiabank customers, who can link their mobile wallet directly to their ScotiaCard or American Express credit card for instant payments via Interac Flash. Interac Mobile Pay is a similar payment solution developed for members of Canada’s largest credit unions. However, it’s only for Android devices running a 4.4 OS or greater. Users simply download the latest version of their financial institution’s mobile app from the Google Play Store, then choose the Mobile Pay option within the app and link their debit card to it. You can find a list of participating Mobile Pay Credit Unions here. 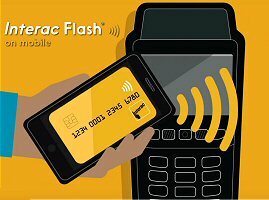 With Interac Flash and Interac Mobile Pay, your smartphone essentially becomes your debit or credit card. You’ll no longer have to pull out your physical wallet or purse, fumbling through the sea of cards, paper money and other miscellaneous items. Instead, you’ll tap the corresponding app, then hold your phone near the merchant’s payment kiosk. The whole process utilizes NFC technology, otherwise known as “Near Field Communication”. This enables your mobile device to communicate and exchange information wirelessly with other electronic devices. In this case, the payment kiosk searches for a signal from a mobile banking app. When they link up, they share information just like they would if you were to swipe a physical card. Interac is so confident in their security procedures, they enforce a zero liability policy for their customers. So long as you don’t compromise your own account through unreasonable acts, you will never be responsible for unauthorized purchases, should they occur. For superior protections, users are subject to certain transaction limits. All purchases of $100 or more require entry of a passcode. Don’t worry about your phone accidentally paying for someone else’s purchases, either. In order to work, the app must be turned on, and the mobile device and payment kiosk must be extremely close; within a few inches of each other at least. Their financial institution supports mobile Interac Flash. Their device hardware (e.g., NFC) supports it. The mobile payment wallet application supports mobile Interac Flash. Check with your Canadian bank or credit union to see of you can use these secure and convenient Interac mobile payment options. Royal Vegas, the #1-Rated Casino for Canadians is currently offering a wide range of credit card deposit options, anything from prepaid gift cards to mastercard and Amex. That, and a world-class gaming experience, with innumerable table games, card games, and live dealers, and fun for everyone ! RV has been in the business for a very long time, a decade long. Thumbs up ! Debit Card Casino Copyright © 2019. Theme by MyThemeShop.